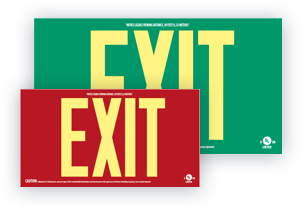 Photoluminescent exit signs are governed by the UL 924 standard. Photoluminescent signaling receives a display distance rating of 50, 75, 100 or 125 feet according to the visibility test procedures. After the photoluminescent material has been exposed to light for one hour, the exit signs must be visible in the dark from a certain distance for at least 90 minutes, similar to the electric powered exit signs. Floor proximity egress path marking systems, like the signs, provide a path along the exit route and must run continuously through doors, aisles, corridors and other similar architectural features. These beacons fall under the UL1994 standard. 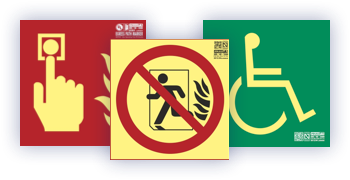 Fire safety and emergency symbols are included in the NFPA standard. 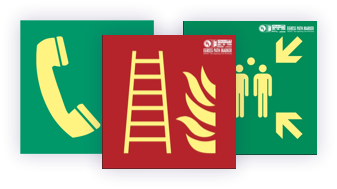 This standard establishes uniform symbols used for fire safety, emergencies and other associated risks. It is designed for both the general public and fire departments, as well as for architectural or engineering plans, plans for insurers, firefighting operations, and diagrams for planning prior to the incident. First and foremost, we focused on logistics, which allowed us to win the PILOT prize for excellence in logistics in 2010. From there, we work on a comprehensive level throughout the company under the European Foundation for Quality Management (EFQM) model. With a great team of professionals in different areas of the company, and through fantastic collaborators, this unites infrastructures and initiatives into one common goal: to give you the best products and services. Five strategic points sum up our clear work strategy and are what guide our work and define us as a company: Quality, R+D+i, exports, responsibility and our customers. 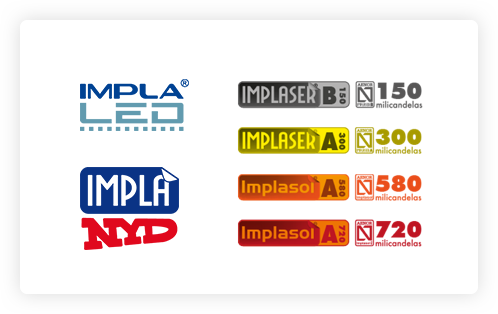 IMPLASER 99 SLL is a Spanish company that manufactures industrial and safety signaling, as well as photoluminescent signaling systems for installations in all types of buildings and industries, combining hybrid photoluminescent-LED technology perfectly. Investigation and development are much more than two words at Implaser: they are part of our DNA from the very start of our company. Our R+D+i department is one of the pillars of our success in the products we offer you and their high-quality standards. Every year we invest between 12 and 18% of our profits to improve our internal management and our products and create new ones that respond to your needs. Almost 40% of our current investment serves to improve internal management, and the remaining 60% to develop new products and improve current ones. Our R+D facilities and laboratories are proof of our commitment to research and development at Implaser. 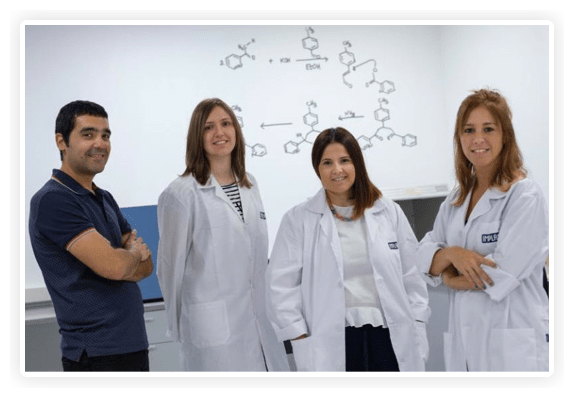 We have the necessary tools so that our excellent team controls every detail of the project and product development with 3 Engineers and someone with a PhD in Chemistry. In addition, we make full use of the facilities of external collaborators of the projects we work with, which opens up an infinite field of applications..
We have partnerships with more than 30 companies, 20 universities and technology centers. This creates crucial synergies where we also strengthen our suppliers, customers and employees, with a single objective: to continue innovating to be more efficient for you.